In the olden time, the Herald’s “gentle science,” the love of Heraldry, which was prevalent amongst all classes, was based upon an intelligent appreciation of its worthiness. A part of the feudal system of the Middle Ages, and at once derived from the prevailing form of thought and feeling, and imparting to it a brilliant colouring peculiar to itself, Heraldry exercised a powerful influence upon the manners and habits of the people amongst whom it was in use. By our early ancestors, it was the “outward sign of the spirit of chivalry, the index, also, to a lengthened chronicle of doughty deeds.” And this Heraldry grew up, spontaneously and naturally, out of the circumstances and requirements of those times. It came into existence, because it was needed for practical use; it was accepted and cherished, because it did much more than fulfil its avowed purpose. At first, simply useful to distinguish particular individuals, especially in war and at the tournament, Heraldry soon became popular; and then, with no less rapidity, it rose to high honour and dignity. From the circumstance that it first found its special use in direct connection with military equipments, knightly exercises, and the mêlée of actual battle, mediæval Heraldry has also been entitled Armory. Men wore the ensigns of Heraldry about their persons, embroidered upon the garments that partially covered their armour, and so they called them Coats-of-Arms: they bore these same ensigns on their shields, and they called them Shields-of-Arms: and in their Armorial Banners and Pennons they again displayed the very same insignia, floating in the wind high above their heads, from the shafts of their lances. The Heraldry or Armory of England, an honourable and honoured member of the illustrious family of mediæval European Heraldry, may be defined as a symbolical and pictorial language, in which figures, devices, and colours are employed instead of letters. Each heraldic composition has its own definite and complete significance, conveyed through its direct connection with some particular individual, family, dignity, or office. Every such heraldic composition, also, is a true legal possession, held and maintained by an express right and title: and it is here-ditary, like other real property, in accordance with certain laws and precedents of inheritance. But in this respect heraldic insignia are singular and unlike other property, inasmuch as it is a general rule that they cannot be alienated, exchanged, or transferred otherwise than by inheritance or other lawful succession. Exceptions to this rule, when they are observed occasionally to have occurred, show clearly their own exceptional character, and consequently they confirm the true authority of the rule itself. It will be understood, as a necessary quality of its hereditary nature, that the significance of an heraldic composition, while “definite and complete” in itself, admits of augmentation and expansion through its association with successive generations. The Language of Heraldry — The original language of English Heraldry was the Norman-French, which may also be designated Anglo-Norman, habitually spoken at the Court of England in the early heraldic era. After a while, a mixed language succeeded, compounded of English and the original Norman-French; and this mixed language still continues in use. Nomenclature — Like its language, the Nomenclature of English Heraldry is of a mixed character, in part technical and peculiar to itself, and in part the same that is in common use. Thus, many of the figures and devices of Heraldry have their peculiar heraldic names and titles, while still more bear their ordinary designations. 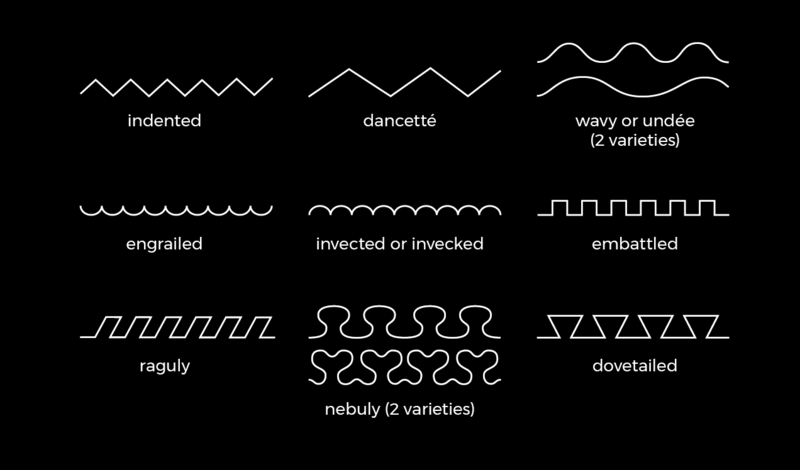 Descriptive terms, whether expressed in English or in French (Anglo-Norman), are generally employed with a special heraldic intention and significance. In the earliest Roll of Arms known to be now in existence, which was compiled (as appears from internal evidence) between the years 1240 and 1245, the Nomenclature is the same that is found in Rolls and other heraldic documents of a later date. This fact of the existence of a definite Nomenclature at that time, proves that before the middle of the thirteenth century the Heraldry of England was subject to a systematic course of treatment, and had become established and recognised as a distinct and independent Science. Two others, less frequently met with, however, are Rayonné and Flory-counter-flory. 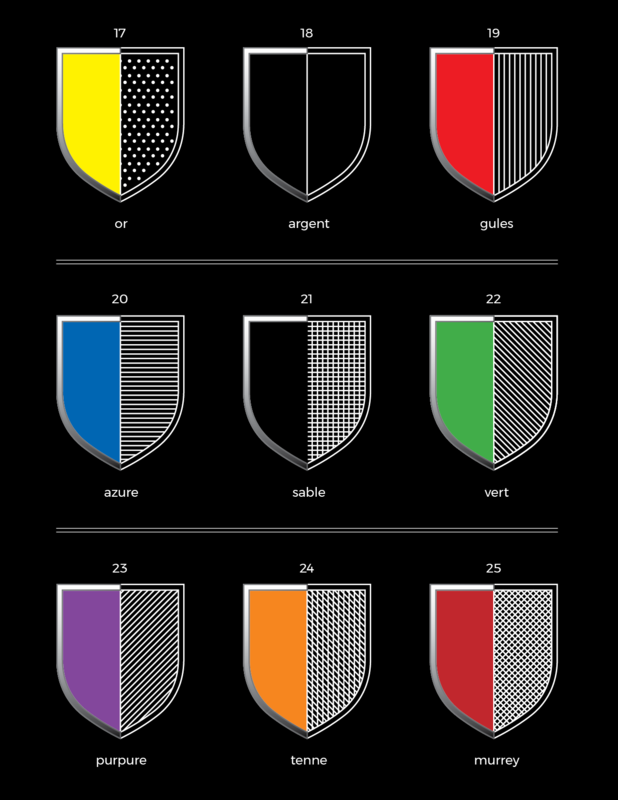 The entire surface of every Shield is termed the Field. The same term is also applied to every plain surface. A Shield is said to be “borne” by the personage to whom it belongs: and, in its turn, the Shield “bears” whatever figures and devices may be displayed upon it; whence, all these figures and devices are entitled Bearings or Armorial Bearings. 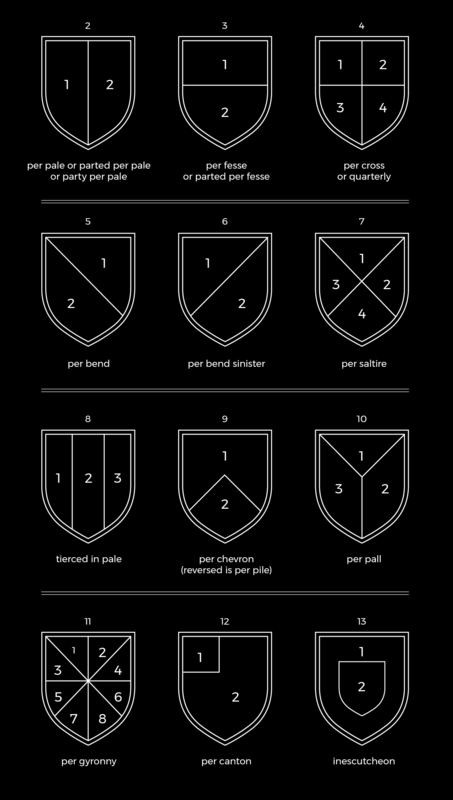 All figures and devices are also styled Charges; and they are said to be “charged” upon a Shield, Banner, or Surcoat, or upon one another. In blazoning, the field of the Shield is always first noticed and described: next follow the charges that rest upon the field of the Shield itself; then descriptions are given of the secondary bearings that are charged upon others of greater importance. As a general rule, of several charges which all alike rest immediately upon the field of the Shield, the most important is the first to be blazoned; so that the arrangement of blazoning is determined by the comparative dignity of the bearings, as well as by the degree in which charges are nearer to the field and further from beholders. In some cases, however, a bearing charged upon the field of a Shield and many times repeated on a small scale, is blazoned (for the sake of simplicity and clearness of expression) next to the field of the Shield itself:— thus, if a lion be charged on the field of a Shield, and a considerable number of crosses surround the lion, and, like him, are placed on the field of the Shield also — the field of the Shield is blazoned first, the crosses second, and the lion third; and, if a crescent (or other bearing) be charged upon the lion’s shoulder, it is the last in the blazon. In quartered Shields the blazoning commences afresh with each quartering. A shield should be recognizable from afar. 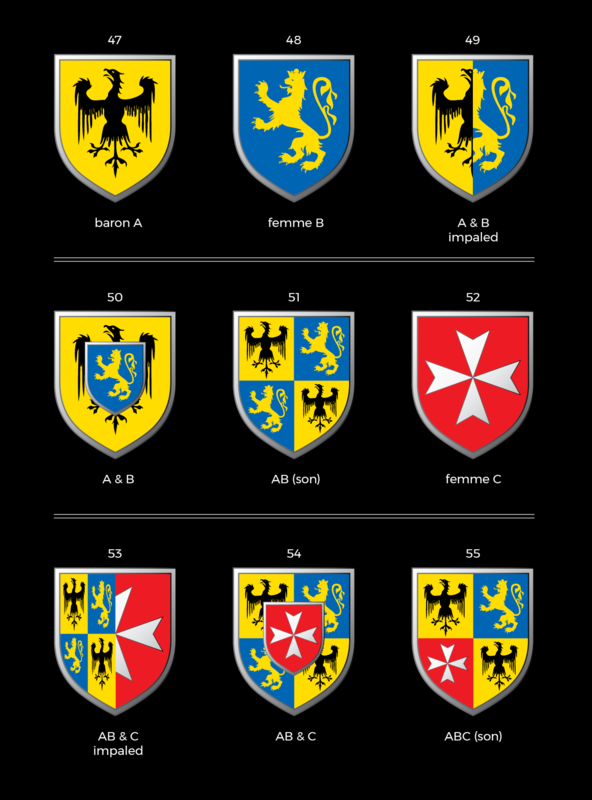 That is why in heraldry only a select number of colours are used. They are called Tinctures or Enamels. Colour nuances or pastels are neglected. And the need for contrast makes it unusual to place a colour on another one. In English Heraldry the Tinctures comprise Two Metals, Five Colours, and the Furs. When printed in just black they are symbolized or indicated by dots and lines — a very convenient system, said to have been introduced, about the year 1630, by an Italian named Silvestre de Petrasancta. Some such symbolisation, however, may occasionally be found in anticipation of Petrasancta. The system now in use was not generally adopted till the commencement of the eighteenth century. This system is never officially employed in a matter of record, and is now being discarded by many artists. In order to avoid repeating or referring to the word “Or,” the word “Gold” is sometimes used. Gold and silver are often visualized as yellow and white. In French Heraldry, Green is Sinople. Two other Colours, or Tints of Colour, are sometimes heard of — Tenne, a tawny or orange colour No. 24 —“Worthy ambition” and Murrey, Maroon or Sanguine, a dark crimson red No. 25 —“Patient in battle and yet victorious”. These two are sometimes termed Stains, but their real usage was in liveries. Animated beings and all objects, that in Heraldry are represented in their natural aspect and colouring, are blazoned Proper. Heraldic charges and compositions, when sketched in outline with pen and ink or with pencil, and with the colours written thereon, are said to be Tricked or In Trick. Should the field of any charge be divided into a single row of small squares, alternately, of a metal and a colour, as it is Componée or Compony (sometimes written Gobony): if into two such rows, it is Counter Compony: but, if the field of a Shield, or the surface of any charge be divided into three, or more than three, such rows, it is Chequée or Checky. The Law of Tinctures — Every charge is supposed to rest upon the field of a Shield, or on the surface of some charge. It is a strict rule, that a charge of a metal must rest upon a field that is of a colour or fur; or, contrariwise, that a charge of a colour must rest on a field that is of a metal or fur, that is, that metal be not on metal, nor colour on colour. This rule is modified in the case of varied fields, upon which may be charged a bearing of either a metal or a colour: also, a partial relaxation of the rule is conceded when one bearing is charged upon another, should the conditions of any particular case require such a concession. This rule does not apply to bordures, nor very stringently to augmentations or crests, and it is not so rigidly enforced in Foreign as in British Heraldry. There are, of course, a few exceptions, but they are not numerous, the one usually instanced as an intentional violation being the silver armorial Shield of the Crusader Kings of Jerusalem upon which five golden crosses are charged; the motive in this remarkable exception to an established rule being said to be to cause this Shield to be unlike that of any other potentate. What may be termed the accessories of a charge are not included in this law of tinctures: thus, a silver lion having a red tongue may be charged on a blue shield, and the red tongue may rest on the blue field of the Shield.Should a Tincture or a Number occur a second time in blazoning a single composition, it must be indicated, not by repeating the word already used, but by reference to it. Thus, if the tincture of the field should occur a second time, reference is made to it in the formula —“of the field:” or, perhaps more frequently —“of the first;” or, if the tincture that is named second in order in the blazoning be repeated, it is indicated by the expression —“of the second;” and so on. Again: should there be three Fleurs-de-Lys and also three crescents in one and the same composition, having specified the “three Fleurs-de-Lys,” the number of the crescents would be set forth in the words —“as many crescents:” providing nothing else has in the wording of the blazon intervened in such a way as to cause uncertainty by the use of the term; and so, in like manner, with any other numbers of these or of any other charges. Emblazoning in Tinctures — On this head I must be content to offer to students only a few brief practical observations. The metal Gold may be rendered with gold prepared in small saucers, or (most advantageously) in minute slabs; this preparation is applied, like a common water-colour, by moistening the gold with water; and it is desirable previously to have washed the paper, card (or vellum) with diluted white of egg. Gold leaf may also be used, but the process is tedious, and requires both skill and experience to ensure complete success. Yellow paint, again, may be used to represent the metal, the best colours being cadmium yellow, or “aureolin” (Winsor and Newton) mixed with Chinese white. For shading, carmine, or crimson lake, mixed with gum. For Silver, aluminium may be used with excellent effect; or Chinese white; or the paper may be left white: for shading, grey (blue and Indian ink mixed) and gum. The Aluminium is prepared, like the gold, in minute slabs: it may be obtained, of great excellence, from Messrs. Winsor & Newton, by whom also a very pure preparation of gold is sold; but both the gold and the aluminium slabs are sold by all good artists’ colourmen. These Metals may be diapered, as well as burnished, with an agate-burnisher. For Azure: French blue, freely mixed with Chinese white and a very little gum, the colour to be laid on thick: shade with Prussian blue mixed with a larger proportion of gum. For Gules: Orange vermilion either pure, or mixed with a very little cadmium yellow or Chinese white, and still less gum: (never use a brilliant but most treacherous preparation known as “pure scarlet:”) shade with carmine or crimson lake, and gum. For Vert: emerald green, with Chinese white and a little gum: shade with dark green, made from mixing aureolin (or gamboge) with Prussian blue and gum. For Purpure: mix carmine and French blue, with a little gum: shade with a darker tint of the same. For Sable: Very dark grey, made by mixing a little Chinese white and gum with black: shade with black and more gum. The Charges —A charge is any object or figure placed on a heraldic shield or on any other object of an armorial composition. Any object found in nature or technology may appear as a heraldic charge in armory. Charges can be animals, objects, or geometric shapes. The most frequent animated charges are the lion and eagle. Other common animals are stags, wild boars, martlets, fish, human figures, dragons, bats, unicorns, griffins, and more exotic monsters. The Ordinaries — The simple Charges of early Heraldry, which always have been held in the highest esteem and which are most familiar, are: the Chief, the Fesse or Bar, the Pale, the Cross, the Bend, the Saltire, the Chevron, and the Pile. They may be considered to have been derived from various means that were adopted to strengthen Shields for use in combat, the Cross always being in great favour from having a definite symbolism of its own. These Ordinaries may be formed by any of the Border Lines (see diagram on page 22). Occasionally they are borne alone; but more generally they are associated with other bearings, or they have various figures and devices charged upon themselves. In some cases, presently to be specified, more than one Ordinary may appear in a single composition. The Bar, the Pale, the Bend, and the Chevron have Diminutives. The Cross has many Varieties. The Subordinaries — This title has been assigned, but without any decisive authority, to another group of devices, second in rank to the Ordinaries. Very few writers agree as to which are ordinaries and which subordinaries; nor does there seem any reason why any distinction between them should exist. Nor, indeed, save that all are exclusively heraldic, why some of them should be regarded as anything more than ordinary charges. These Subordinaries are the Canton, the Quarter, the Inescutcheon, the Orle, the Bordure, Flanches, the Lozenge, the Fusil, the Billet, the Gyron and the Pallium. The Canton, by the early Heralds commonly styled the “Quarter,” sometimes has been grouped with the Ordinaries. And it must here be observed that the Lozenge, the Fusil, the Billet and the Gyron were not used as single charges by the early Heralds; but by them the fields of Shields were divided lozengy and gyronny, or they were semée of Billets, from which the single charges evidently were afterwards obtained. 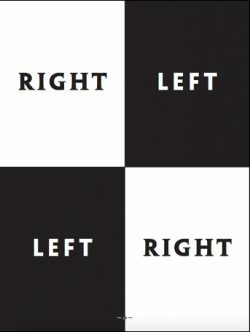 Each of the above ordinaries is commonly said to take up one-third of the field in theory, though in practice they are usually made somewhat narrower. Less widespread are the Flaunches, Pall and Pile (a tapered Pale, pointed at the bottom). The quarter, for instance is an upper quadrant of the field, occurs rarely as an ordinary, but its diminished version the canton is frequently found, usually as a mark of distinction (showing that the bearer has no blood relationship to the bearers of the arms without the canton); it theoretically occupies the first third of the chief. Ordinaries may appear in parallel series, in which case English blazon gives them a different name: more Pales, Bars, et cetera are blazoned as Paly, Barry, Bendlets, Chevronels and so on. 3. Thirdly, the association of certain insignia with a Shield of arms, so as to produce a complete heraldic achievement. with an Inescutcheon: a smaller shield appears in front of the main shield. A few very simple diagrams will clearly elucidate the principle of Marshalling the arms of Husband and Wife. Suppose Baron A to represent the Husband, and Femme B the Wife: then, No. 47 may represent the arms of the Husband, and No. 48 the arms of the Wife. If B be not an heiress, the arms of A and B, as husband and wife, are borne impaled, as in No. 49; and their son bears No. 47 only. If B be an heiress, the arms of A and B, as husband and wife, are borne as in No. 50 — the arms of the wife on an Escutcheon of Pretence; and, in this case, the son of A and B quarters the arms of both his parents, as No. 51.
paternal Shield, as in No. 54; and his son, by this heiress, as before, would quarter the arms of both his parents, as in No. 55. It is obvious that Marshalling on this system (of which I here give the general outline) admits of a widely-extended application. Younger sons in all cases place over all the quarterings of their Shield their own distinctive Mark of Cadency, until they inherit some different quartering from those to which the head of their house is entitled, and the quartering itself then forms sufficient difference.